We’ve long been promoting the amazing work done by Manchester Institute of Biotechnology (MIB) and Joy Milne – the woman who can smell Parkinson’s. Upon their recent publication; Discovery of Volatile Biomarkers of Parkinson’s Disease from Sebum, we thought it only right to give you a complete run down on the technology behind the story. The study was made possible by combining dynamic headspace (DHS) gas chromatography mass spectrometry and an odour detection port (ODP). ODP’s are routinely used in the flavour and fragrance industry to detect which chemicals add which notes to products and raw materials but this is the first time this approach has been applied to a clinical context. It’s already showing enormous potential for advancing the identification of diseases in people through swab testing or similarly non-invasive techniques. Discovery of Volatile Biomarkers of Parkinson’s Disease from Sebum is available here for free so download a copy for the full methodology of the study. This post will focus specifically on the technology involved. Joy Milne is gifted with an incredibly acute sense of smell which allows her to smell Parkinson’s – a disease without any significant markers beyond motor symptoms and which is extremely difficult to detect chemically. All people secrete a waxy bio fluid called sebum from their skin. Sebum is rich in lipids and its over-production is a known symptom of people with Parkinson’s Disease. The volatiles present in this liquid are what Joy could smell on her husband Les, many years before he exhibited any symptoms or was diagnosed. Upon hearing about her ability, Joy’s doctor approached contacts at MIB who tested her using swabs of cloth taken from a control group and a group of sufferers. On recommendation from another of our collaborators, MIB approached Anatune, beginning a long collaborative relationship. Since Joy’s ability was based on her sense of smell, naturally MIB wanted to investigate the volatiles released by the sufferers of Parkinson’s. The thermal desorption of the swabs taken showed that there were significant differences but deciding which were relevant required Joy to sit in front of the ODP and use her ability to identify the aroma molecules which she associated with the disease. DHS is a sample introduction technique which extracts and concentrates volatile analytes onto a trap. For this study, the swabs taken from patients and the control group were placed into a 20 mL headspace vial. The sample was kept at a constant temperature while the headspace was purged through the trap by means of flow of inert gas, providing controlled and efficient extraction conditions. In this case DHS was applied to solid swabs but the technique also allows for liquid samples. The process was fully automated. 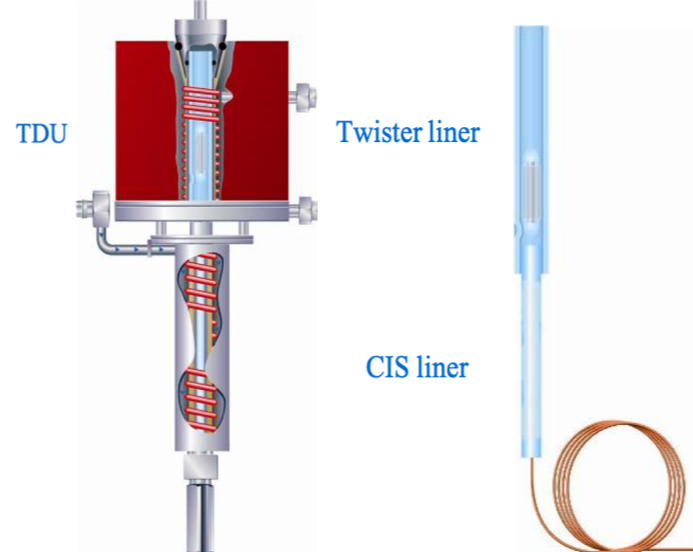 Once the swabs had been extracted and using DHS, the traps were thermally desorbed directly onto the front of the GC column through a thermal desorption unit (TDU) onto a cooled inlet system (CIS). This allowed the desorbed volatiles to enter the GC column in tight bands with little band broadening. 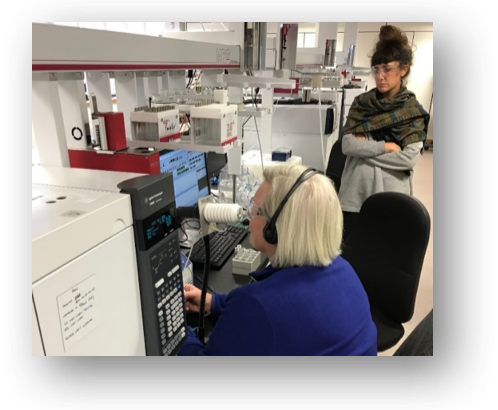 ODP’s allow people to smell compounds as they elute from the gas chromatograph. They are often used in the flavour and fragrance industry to detect which chemicals add which notes to products and raw materials. The effluent was split as it left the column, arriving simultaneously at the nose and MS detector. The aroma’s potency and aroma character is assessed after GC separation as these mixtures can be complex and overall aromas are a mixture of individual chemicals. Each individual chemical contributes uniquely to each aroma. Separating individual compounds held the potential to identifying the volatile biomarkers produced by Parkinson’s sufferers and the ODP allowed Joy to smell them separately from the natural sebum background secreted by patients and healthy individuals alike. The swabs were first analysed using a standard single quadrupole mass spectrometer. A mass quadrupole time of flight mass spectrometer was also used for its ability to give accurate mass and uniform data density across the chromatogram which was retro-minable after the experiment. Using voice recognition software and graded response switch, the ODP system could describe the intensity of the aroma received during the GC run. The responses were combined with the labels and descriptors while olfactograms were compared alongside each other. This enabled the matching up of mass spectrometry responses with odour responses to identify the potential chemicals which are the biomarkers for Parkinson’s. It is believed that Parkinson’s disease may only be the start of using this type of technology to develop early indicator tests for many other diseases. Early diagnosis of degenerative disease is essential in ensuring early treatment and the reduction of suffering of patients. Early, non-invasive diagnosis may even prolong lives by long enough for new treatments to be discovered. While this technique is still in its infancy, every development in early diagnosis and treatment of these diseases contribute to a base of knowledge that may eventually yield a cure.